Striper Talk Striped Bass Fishing, Surfcasting, Boating » Build Stuff: Custom Plug & Lure Building, Rod Building » Plug Building - Got Wood? Plug Building - Got Wood? Got Plug? 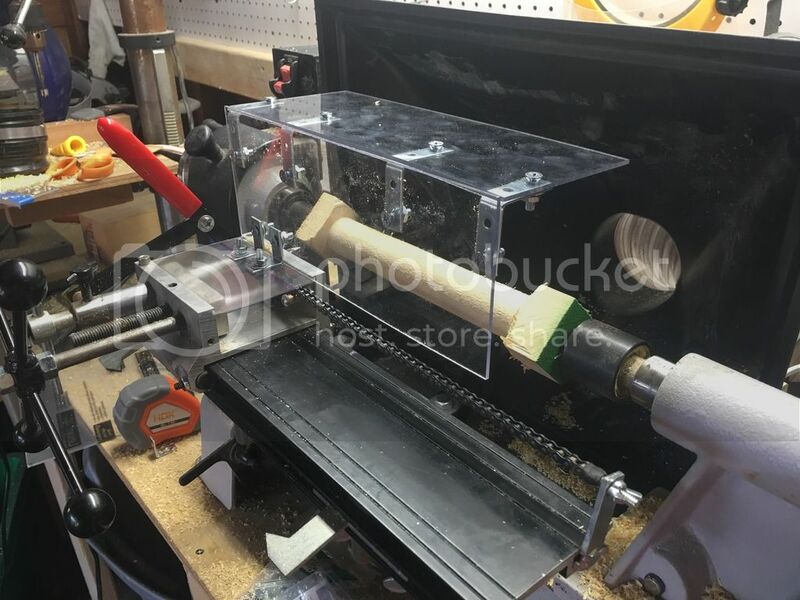 So after spending time at the Bigfish workshop/mancave I realized I needed to do some simple but effective upgrades and maintenance to my lathe and dupe. Wrapped the prof m blade holder in electrical tape, so that it didn't wiggle, and the set screw has something to hold onto. Tightened carriage on vega. Which is a pain cause there's 4 set screws and a little turn makes a big deal. Cleaned all tracks on the vega and rewaxed the deck on it and the lathe. Found some clear plexi/lexan storage bins that I think will work great once I get the overall design done. Hoping to find something close and just cut away the excess and mount it. Thats cool but can you easily access the block to change it out quickly and also to sand the finished plug? Almost time to get our fish on!!! I think sides will be more important on that cover. The chips seem to go left and right but never really back at you. I only worry about the dust and let the chips fly. Nobody calls me Lebowski. You got the wrong guy. I'm the Dude, man. "A beach is a place where a man can feel he's the only soul in the world that's real"
OK Chris, picture of the tape on the cutter, please. Second, the sset screws on the Vega deck. How do they tighten, untighten, so the dupe will stop vibrating? Amazingly, I am on line tonight to asked some of these questions that Chris has asked/answered. I need to know how to adjust the four deck sets screws the most. Assuming I loosen the nuts on the set screws, then tighten the screws by turning clockwise, ? Frank grab the dupe head with 2 hands and shake back and forth. This will give you an idea what adjusters need tightning. loosen lock nuts and snug allen screws on either the front or back. Back off allen screws slightly. Turn levers till it moves smooth. Snug nuts and rotate to both ends. Some units feel fine to left but tight to right. Being the left side groove has more wear. Mine do. Also clean and lube V track. I use W-40. Also the nylon bushing may need replacing if worn badly.